The M-Cubed CubeSat mini-satellite, built by Michigan students, will be used to test high resolution camera hardware for a future NASA Earth science mission. Credit: The Michigan Exploration Lab. 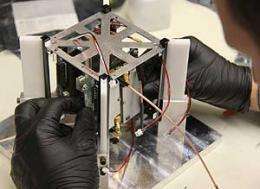 (PhysOrg.com) -- When the M-Cubed satellite, built by University of Michigan students, goes into orbit, it will become the first CubeSat to test a NASA instrument for major space missions. It is scheduled to be launched on Oct. 28. A CubeSat is cubic mini-satellite, about four inches per side, with a mass of no more than 3 pounds. CubeSats take little time to design, are inexpensive to build and can be launched as secondary payloads in standardized pods that attach easily to the launch vehicles. These characteristics make CubeSats an inexpensive, efficient way to test space-flight components and software for subsequent major space missions. James Cutler, an assistant professor in the U-M departments of Aerospace Engineering and Atmospheric, Oceanic and Space Sciences, said that CubeSat technology is "raising the readiness level so that future missions can have confidence in their ability to perform in orbit." NASA selected M-Cubed to evaluate and certify the Virtex-5 Field-Programmable Gate Array, a new instrument designed to process images taken by a multi-directional, multi-wavelength camera that has been under development at NASA's Jet Propulsion Laboratory. One of the missions the camera will be used on is the Aerosol-Cloud-Ecosystem (ACE) mission, which will take high-resolution images of the Earth. The mission is slated to launch between 2013 and 2016. M-Cubed will be accompanied by a second University of Michigan student-built satellite, RAX-2, which will study irregularities in the density of plasma in the ionosphere. Students in the U-M Student Space Systems Fabrication Lab (S3FL) used hardware purchased in local retail stores to build much of M-Cubed. The students were equally frugal in the development of RAX-2, using spare parts from its forerunner, RAX-1, to build major components. The RAX device is a stack of three CubeSat units, making it about a foot high and about four inches square at the base. Using one-unit CubeSats to build larger satellites, such as the three-unit RAX, has accelerated production dramatically. The upcoming mission is part of the third NASA Educational Launch of Nanosatellites (ELaNa) project. M-Cubed is the first CubeSat funded through the Advanced Technology Initiative in NASA's Earth Science Technology Office. The RAX project has been and continues to be a joint venture between the University of Michigan and SRI International, and is the first CubeSat program sponsored by the National Science Foundation. SRI is an independent nonprofit research and development organization. If the Delta II launch vehicle performs as it should, the mission will mark the first successful launch of CubeSats by a NASA vehicle. The Student Space Systems Fabrication Lab (S3FL) is a U-M student organization that expands the classroom experience by giving students hands-on experience with the design, analysis, fabrication, integration and operation of functional flight vehicles and space payloads. Each year, more than a hundred undergraduate and graduate students participate in S3FL activities that cross a range of activities, such as microgravity experiments and nanosatellite design-build-test projects that enable students to develop quickly in ways that would otherwise take years of post-graduate work.